SENDAI - A new shopping center opened Friday on elevated land in Minamisanriku, Miyagi Prefecture, providing shops that had been operating out of temporary premises new footing in the tsunami-wiped town. 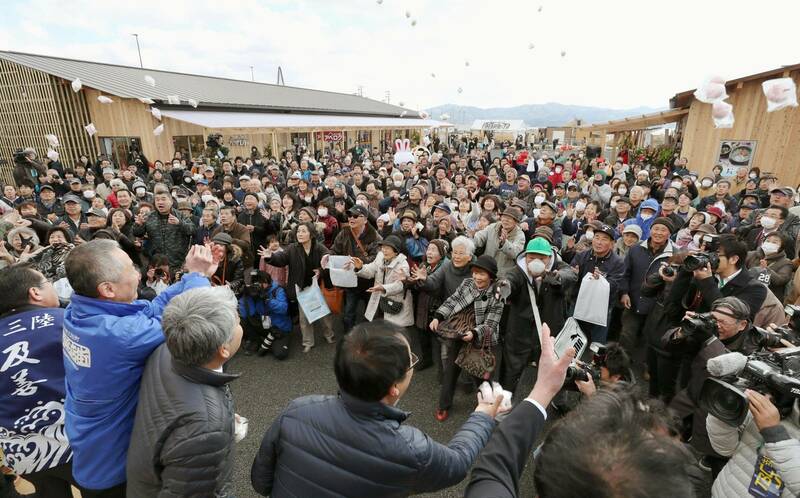 Marking a new phase in the town’s reconstruction, 28 shops opened at Minamisanriku Sun Sun Shopping Village in six wooden buildings designed by Kengo Kuma, the famed architect behind the new National Stadium to be used in the 2020 Olympics. The shops include restaurants serving fresh local seafood, a hair salon and souvenir shops. Of the 32 business that were in the temporary shopping center, 23 moved into Sun Sun Shopping Village with five other businesses. Floral wreaths and colorful banners were placed in front of each shop on opening day. “I hope the shopping arcade and the town will thrive,” said Eishi Chiba, 61, who is selling seaweed products in the new arcade. The shopping center is run by Minamisanriku Town Future and is near the town’s disaster prevention building, where 43 people died after being swept away by the giant waves on March 11, 2011. Work to elevate land continues nearby. The arcade is part of a new area under construction where a seafood plant and large supermarket are among other facilities scheduled to open. The new bus system that replaced the area’s railways will also stop nearby. “We hope residents and people from across Japan and the world will visit,” Hiroaki Miura, president of Minamisanriku Town Future, said at the opening ceremony. 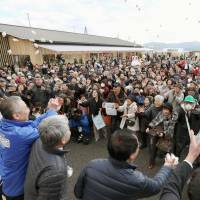 Minamisanriku Mayor Jin Sato said the temporary shopping village attracted many visitors and said he hopes the new arcade will continue to do the same. The temporary arcade opened about a year after the disaster.